Computed tomographic scan of the abdomen reveals dilation of the small bowel with multiple air-fluid levels in the absence of a transition point. Hypothesis Postoperative enteral nutrition may sometimes be responsible for severe complications such as mesenteri ischemia. Data Sources Studies in the English literature were identified by a computer-assisted search of the MEDLINE database using the key words “enteral feeding OR jejunostomy” AND “complications OR mesenteric ischemia.” Cited references of each retrieved paper were checked for relevance. Study Selection All reports of mesenteric ischemia in the setting of postoperative enteral feeding were included. In cases of multiple articles from the same institution with overlapping patients, the most exhaustive article was included. Data Extraction All reports were abstracted for number of patients, presence of preoperative comorbidities, development of perioperative hypotension or mesenteric occlusion, and outcome. Data Synthesis Nine studies were retrieved in which enteral feedings were responsible for bowel ischemia; we report an additional case. The common clinical picture is that of a patient without significant risk factors for mesenteric ischemia, which during the early postoperative course develops nonspecific abdominal symptoms and then rapidly progresses to septic shock and eventually to multisystem organ failure and death. Mesenteric ischemia may present in up to 3.5% of enterally fed surgical patients; the associated mortality approaches 100%. The lack of specific symptoms requires a high index of suspicion for diagnosis; prompt abdominal exploration and bowel resection are the only chance for survival. Conclusions The benefits of enteral nutrition outweigh the likelihood of severe complications; when mesenteric ischemia develops, early diagnosis is challenging and the prognosis is poor. Enteral feeding has been reported to have very few complications, mostly diarrhea and aspiration; tube placement–related morbidity is uncommon and includes intraperitoneal leak, bowel obstruction, wound infection, and fistula formation.7 As a result, an increasing number of surgeons feed their patients postoperatively by means of a jejunal tube with little concern for complications. However, nonspecific signs of intolerance to tube feeding (diarrhea, nausea, bloating, abdominal pain) occasionally may progress to a syndrome of abdominal distension, hypotension, and hypovolemic shock and eventually to small bowel necrosis. Our recent observation of a patient who suffered bowel ischemia secondary to enteral feeding stimulated us to review the existing literature to clarify pathophysiologic features, clinical features, and outcomes of a complication easily underestimated in its early presentation and with catastrophic results when not promptly addressed. A 54-year-old morbidly obese woman (body mass index [calculated as weight in kilograms divided by the square of height in meters], 49) with a history of hypertension and thyroid cancer presented with stage III esophageal adenocarcinoma. She underwent neoadjuvant chemotherapy and radiation therapy followed by a transthoracic esophagectomy and placement of a feeding catheter jejunostomy. There were no complications during the operation, and the patient experienced no episodes of perioperative hypotension. Tube feedings were started on the first postoperative day with a balanced formula (460 mOsm/kg) at a rate of 25 mL/h and advanced by 25 mL/h every day to a goal of 70 mL/h on postoperative day 3. The nasogastric tube output was 30 mL on the third postoperative day, and the first bowel movement was recorded on the fourth postoperative day. At that time, the patient was doing well; she remained afebrile with a benign abdominal exam. During the subsequent 2 days, however, she started to experience abdominal distension and discomfort. The nasogastric tube output did not appear to contain enteral feedings but increased to 1000 mL/24 h; the enteral feedings were held. On the seventh postoperative day, the patient developed hypotension and worsening abdominal tenderness, shortly followed by respiratory and renal failure. Esophagogastroscopy demonstrated a viable gastric tube with normal mucosa. A computed tomographic scan of the abdomen revealed mild ascites and distended loops of small and large bowel (Figure). We suspected an intra-abdominal source of sepsis and brought the patient to the operating room. On emergency abdominal exploration, full thickness necrosis of the small bowel was noted, beginning at the site of the jejunostomy and extending distally for about 40 cm; the rest of the small bowel appeared viable. Doppler examination revealed patent mesenteric vessels both in the ischemic segment and throughout the remaining small and large bowel. No perforation, obstruction, or torsion at the jejunostomy site was noted. The patient underwent small bowel resection with primary anastomosis. A second-look laparotomy performed the following day showed viable bowel in the region of the anastomosis. Pathological examination of the resected specimen confirmed transmural ischemic necrosis. After a complicated postoperative course, the patient died of respiratory complications on the 25th postoperative day. No autopsy was performed. All relevant published studies in the English literature were identified by computer-assisted search of the MEDLINE database; we didn't limit the search to a specific period. References were retrieved using key words that included “enteral feeding OR jejunostomy” AND “complications OR mesenteric ischemia.” The cited references of each retrieved paper were also checked for relevance. All studies describing observations of mesenteric ischemia directly related to enteral feeding were included in the review. Studies in which bowel ischemia was likely secondary to mechanical complications of tube feeding (eg, obstruction or torsion of bowel at the jejunostomy site) were excluded. In cases of multiple articles from the same institution with overlapping patients, the most detailed article was included in the analysis. 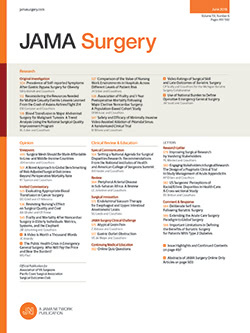 All reports were reviewed for relevant study data: incidence and clinical presentation of bowel ischemia, age of patients, presence of risk factors for diminished mesenteric blood flow (such as diabetes, atherosclerotic vascular disease, or congestive heart failure), occlusion of mesenteric vessels, episodes of perioperative hypotension, and mortality. We identified 9 articles in the English literature that described postoperative mesenteric ischemia in 31 patients in the absence of mechanical bowel obstruction (Table).4,8-15 Four articles specified the total number of patients exposed to enteral feeding during the observation period; the incidence of feeding-related bowel ischemia varied between 0.14% and 3.5%, the lowest incidence being observed in the largest population. Mesenteric ischemia occurred in patients of any age (mean, 48 years) operated on either for abdominal trauma or for elective organ resection. Comorbidities potentially responsible for low mesenteric blood flow such as diffuse atherosclerotic disease, diabetes, or congestive heart failure were usually absent; only a patient described by Gaddy et al9 had a medical history remarkable for 2 myocardial infarctions but did not have heart failure at time of presentation. The commonly described clinical picture was that of a patient who had undergone an abdominal procedure without complications and had been started on early enteral feeding through a jejunostomy or a nasojejunal tube. In the early postoperative course, nonspecific abdominal signs and symptoms (bloating, crampy pain, loss of bowel function) developed, rapidly followed by hyperdynamic shock and eventually multisystem organ failure and death. About 31% of patients suffered systemic arterial hypotension before or at the time of onset of abdominal signs. Exploratory laparotomies consistently showed bowel ischemia starting at the site of the feeding tube and extending distally for a variable distance. No author described occlusion of the mesenteric vessels. Mortality varied between 41% and 100%. The concept of early postoperative enteral nutrition is supported by the observation of a blunted reactive hypermetabolic response and reduction of septic complications in patients receiving immediate feedings, possibly on the basis of improved mucosal barrier function and decreased bacterial translocation.16-20 Many surgeons favor placement of a feeding jejunostomy at the completion of major abdominal procedures because small bowel function remains relatively intact in the early period after operation or injury.6,21 Furthermore, a jejunostomy provides comfortable and long-term access for enteral feeding should the patient experience postoperative complications restricting oral intake for a prolonged period. The absorption of intraluminal nutrients increases energy demands in metabolically stressed enterocytes, therefore putting the intestine at risk for ischemia in patients with systemic hypoperfusion; however, the gut can survive periods of profound hypoperfusion with protective mechanisms such as the ability to increase oxygen extraction and to redistribute flow within the intestinal wall favoring the mucosa.15,22,24,25 Furthermore, the majority of patients described in the literature (Table) and the patient observed by us did not suffer major episodes of hypotension or hypovolemia during the operation or in the postoperative period. Therefore, it is unlikely that either early hypovolemic shock with incomplete resuscitation or episodic hypotension later in the patient's course would be solely responsible for this problem. Systemic hypotension did occur in our patient after gastrointestinal symptoms were already evident and therefore was believed to be secondary to the intra-abdominal process and not the cause. Moreover, in our patient as well in previous reports (Table), mesenteric pulses were clearly present in the vascular distribution to the ischemic segments, essentially eliminating an occlusive vascular event as an explanation. Most of the cases reported in the literature occurred in young patients (Table) where full-dose nutrition was tolerated for average of 8 days prior to the development of bowel ischemia. In our case, the clinical picture developed more rapidly. With the data available from published reports, it is not possible to identify risk factors suggestive of diminished mesenteric blood flow that could be used to identify patients who are not candidates for enteral feeding or that would reliably diagnose this entity before bowel necrosis had occurred. The occurrence of abdominal pain and distension, high nasogastric output, and signs of intestinal ileus should result in immediate discontinuation of tube feeding rather than repeated attempts to alter the formula and feeding schedules. In the presence of worsening clinical parameters, early surgical exploration should be considered. Unfortunately, many patients who develop intestinal necrosis associated with enteral feeding are diagnosed late in their course, with resulting significant morbidity. Conservative therapy in these cases of bowel compromise increases morbidity and mortality. An early exploratory laparotomy with resection of all involved segments of the bowel is the only chance of cure. Enteral nutrition through a feeding jejunostomy offers several advantages compared with total parenteral nutrition for the postoperative patient, and its benefits usually outweigh the likelihood of severe complications. Several authors have reported the association of small bowel ischemia and necrosis with catheter jejunostomy. Early signs of this syndrome are very nonspecific and clinical factors for identifying patients at risk are lacking. Distension is a nonspecific but ominous finding and should prompt discontinuation of tube feeding and close monitoring. A worsening general condition or sepsis mandates early operative intervention with resection of ischemic bowel as the only way to decrease morbidity and mortality. Correspondence: Alessandro Fichera, MD, Department of Surgery, University of Chicago, 5841 S Maryland Ave, MC 5031, Chicago, IL 60637 (afichera@surgery.bsd.uchicago.edu). Accepted for Publication: July 25, 2005.